I gave in my last article some reasons for believing that in the “transitional” state of Russia chief significance attaches to the mental and moral (pace the Marxians) change that is taking place; that while in the end this transformation is supposed to be a means to economic and political change, for the present it is the other way around. This consideration is equivalent to saying that the import of all institutions is educational in the broad sense—that of their effects upon disposition and attitude. Their function is to create habits so that persons will act cooperatively and collectively as readily as now in capitalistic countries they act “individualistically.” The same consideration defines the importance and the purpose of the narrower educational agencies, the schools. They represent a direct and concentrated effort to obtain the effect which other institutions develop in a diffused and roundabout manner. The schools are, in current phrase, the “ideological arm of the Revolution.” In consequence, the activities of the schools dovetail in the most extraordinary way, both in administrative organization and in aim and spirit, into all other social agencies and interests. The connection that exists in the minds of Soviet educators between the formation of attitudes and dispositions by domestic, industrial and political institutions and by the school may perhaps be indicated by reference to the account given, by one of the leaders of the new education, of his own development. His efforts at educational reform date back to the early years of this century, when he joined with a fellow Russian (who had been connected with the University Settlement In New York City) in conducting a social settlement in the working men’s quarter in Moscow. Naturally they were compelled to operate along non-political lines and in the neutral fields of children’s clubs, recreation, health, etc. ; in fact. In the familiar fields of our own settlements of the distinctively philanthropic type. Even so, they met with constant opposition and embarrassment from the old regime. For example, the educator who told this story was one of the first to introduce football into Russia; in consequence, he spent several months in jail. For the authorities were convinced that there could be only one object In playing the game: namely, to train young men so that tbey could throw bombs more accurately! (Incidentally, I may remark that the spread of sports and games is one of the characteristic features of existing social life; one Sunday afternoon, for example, we attended a trotting match sponsored by the horse-breeding department of the government commissariat of agriculture, and a soccer match, each having an audience of fifteen to twenty thousand persons.) In 1911, wishing a broader field, he started an educational experimental station in the country, some eighty or a hundred miles distant from Moscow, 2;ettinQ: assistance from well-to-do Russians of liberal temper. This school, so I was informed, was based on a combination of Tolstoy’s version of Rousseau’s doctrine of freedom and the idea of the educational value of productive work derived from American sources. 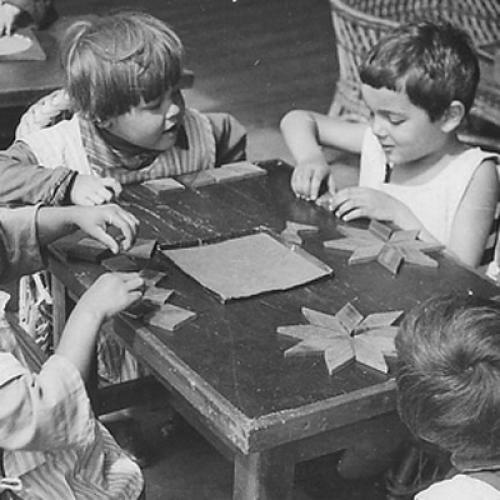 The story thus far is of some historical significance in indicating some of the causal factors in the present Soviet educational system. But its chief value depends upon a further development; especially the effect upon the minds of educational reformers of the constant opposition of established authority to even the most moderate and non-political efforts at educational reform and amelioration of the condition of the working population. The educator of whom I am speaking began as a liberal reformer, not a radical but a constitutional democrat. He worked in the faith and hope that the school, through giving a new type of education, might peacefully and gradually produce the required transformations in other institutions. His pilgrim’s progress from reforming pedagogue to convinced communist affords a symbol of the social phase of the entire Soviet educational movement. In the first place, there was the striking and inescapable fact that those reforming and progressive endeavors which were hampered in every possible way by the Tsar’s regime were actively and officially promoted by the Bolshevist regime, a fact that certainly influenced many liberal intellectuals to lend their cooperation to the Bolshevist government. One of them, not a party member, told me that he thought those intellectuals who had refused to cooperate wherever they could with the new government had made a tragic mistake; they had nullified their own power and had deprived ‘ Russia of assistance just when it was most needed. As for himself, he had found that the present government cleared the way for just the causes he had had at heart in the old regime but whose progress had always been hopelessly compromised by its opposition; and that, although he was not a Communist, he found his advice and even his criticism welcomed, as soon as the authorities recognized that he was sincerely trying to cooperate. And I may add that, while my experience was limited, I saw liberal intellectuals who had pursued both the policy he deplored and the one he recommended. There is no more unhappy and futile class on earth than the first, and none more fully alive and happy—in spite of narrowly restricted economic conditions, living quarters, salaries, etc.—than the second. This first consideration, the almost unimaginable contrast between the career and fate of social aspirations under the old regime and under the Soviet government, is something to which I, at least, had not given due weight in my prior estimates of Bolshevist Russia. And I imagine there are many who, while they are aware in a general way of the repressive and despotic character of the Tsar’s government, unconsciously form their appraisal of the present Russian system by putting it in contrast with an imaginary democratic system. They forget that for the Russian millions the contrast is with the system of which alone they have had actual experience. The Russian system of government at the present time is like that to which the population has been accustomed for centuries, namely, a personal system; like the old system, it has many repressive traits. But viewed in the only way which the experience of the masses makes possible for them, it is one that has opened to them doors that were formerly shut and bolted; it is as interested in giving them access to sources of happiness as the only other government with which they have any acquaintance was to keep them in misery. This fact, and not that of espionage and police restriction, however excessive the latter may be, explains the stability of the present government, in spite of the comparatively small number of Communists in the country. It relegates to the realm of pure fantasy those policies for dealing with Russia that are based on the notion that the present government is bound to fall from internal causes” if only it can be sufficiently boycotted and isolated externally. I know of nothing that is more indicative of the state of illusion in which it is possible for isolated groups to live than the fact that, of five or six Russian dailies published by the Emigres in Paris, three are devoted to restoration of the monarchy. I have become involved in a diversion, though one naturally suggested by the marvelous development of progressive educational ideas and practices under the fostering care of the Bolshevist government—and I am speaking of what I have seen and not just been told about. However, the second factor that operated in the transformation of the educator (whose history I regard as typical and symbolic) takes us out of the region of reforming and progressive ideas into that of communism proper. It is the factor that would, I am sure, be emphasized by every Communist educator rather than that which I have just mentioned. The frustration of educational aims by economic conditions occupied a much larger place in the story of the pilgrim’s progress from pedagogy to communism than did explicit and definite political and governmental opposition. In fact, the latter was mentioned only as an inevitable by-product of the former. There are, as he puts it, two educations, the greater and the smaller. The lesser is given by the school; the larger, and the one finally Influential, is given by the actual conditions of life, especially those of the family and neighborhood. And according to his own story, this educator found that the work he was trying to do in the school, even under the relatively very favorable conditions of his experimental school, was undone by the educative—or miseducative—formation of disposition and mental habit proceeding from the environment. Hence he became convinced that the social medium and the progressive school must work together, must operate in harmony, reinforcing each other, if the aim of the progressive school was not to be constantly undermined and dissipated; with the growth of this conviction he became insensibly a Communist. He became convinced that the central force in undoing the work of socialized reform he was trying to achieve by means of school agencies was precisely the egoistic and private ideals and methods inculcated by the institution of private property, profit and acquisitive possession. The story is instructive because of its typically symbolic character; if it were expanded, it would also lead into an account of the definite content of Soviet school activities in the concrete. For as far as the influence of this particular educator is concerned (and it extends very far), the subject matter, the methods of teaching, and the spirit of school administration and discipline are all treated as ways of translating into actuality harmony of operation between concrete social conditions—taking into account their local diversity—and school procedures. My contacts were not sufficiently prolonged to enable me, even if space permitted, to give an adequate report of the structure and technique of this work of harmonization. But its general spirit may at least be suggested. During the transitional regime, the school cannot count upon the larger education to create in any single and whole-hearted way the required collective and cooperative mentality. The traditional customs and institutions of the peasant, his small tracts, his three-system farming, the influence of home and Church, all work automatically to create in him an individualistic ideology. In spite of the greater inclination of the city worker towards collectivism, even his social environment works adversely in many respects. Hence the great task of the school is to counteract and transform those domestic and neighborhood tendencies that arc still so strong, even in a nominally collectivistic regime. In order to accomplish this end, the teachers must in the first place know with great detail and accuracy just what the conditions are to which pupils are subject in the home, and thus be able to interpret the habits and acts of the pupil in the school in the light of his environing conditions—and this, not just in some general way, but as a definitely as a skilled physician diagnoses in the light of their causes the diseased conditions with which he is dealing. So this educator described his philosophy as “Social Behaviorism.” Whatever he saw, a mode of farming, farm implements, style of home construction, domestic industry, church building, etc., led him to ask for its probable effect upon the behavior of those who were subject to its influence. On the other hand the teacher strove to learn, whenever he was confronted with any mode of undesirable behavior on the part of a pupil, how to trace it back to its definite social causation. Such an idea, however, illuminating in the abstract, would, of course, remain barren without some technique to carry it into effect. And one of the most interesting pedagogical innovations with which I am acquainted is the technique which has been worked out for enabling teachers to discover the actual conditions that influence pupils in their out-of-school life; and I hope someone with more time than I had at command will before long set forth the method in detail. Here, of course, is the point at which the socially constructive work of the school comes in. A little something will be said about this later in detail, when I come to speak of the idea of “socially useful” work as a criterion for deciding upon the value of the “projects”—for Soviet education is committed to the “project method.” But aside from its practical working out, it is also interesting in that it is locating one of the burning points of present Russian pedagogical theoretical education. For there is still a school that holds that educational principles can be derived from psychology and biology—although the weight of citations from Marx is now eclipsing their influence—and that correct educational methods are bound to produce the desired effect independently of concrete knowledge of domestic and local environment. I have dwelt too long on certain general considerations, at the expense of any account of what schools are actually doing and how they are doing it. My excuse is that, in relation to the entire Russian situation, it is these generic points of social aspiration and contact that are significant. That which distinguishes the Soviet system both from other national systems and from the progressive schools of other countries (with which they have much in common) is precisely the conscious control of every educational procedure by reference to a single and comprehensive social purpose. It is this reference that accounts for the social interlocking to which I referred at the outset. The point may be illustrated by the bearing of school activity upon the family institution as that is conceived by the orthodox Marxian socialists. That thorough-going collectivists regard the traditional family as exclusive and isolating in effect and hence as hostile to a truly communal life, is too familiar to require rehearsal. Apart, however, from the effect of the oft-recited Bolshevist modifications of marriage and divorce, the institution of the family is being sapped indirectly rather than by frontal attack; its historic supports, economic and ecclesiastical, are weakened. For example, the limitation of living quarters, enforced in Russia as in other countries by the War, is deliberately taken advantage of to create social combinations wider than that of the family and that cut across its ties. There is no word one hears oftener than Gruppe, and all sorts of groups are instituted that militate against the primary social importance of the family unit. In consequence, to anyone who looks at the matter cold-bloodedly, free from sentimental associations clustering about the historic family institution, a most interesting sociological experimentation is taking place, the effect of which should do something to determine how far the bonds that hold the traditional family together are intrinsic and how far due to extraneous causes; and how far the family in its accustomed form is a truly socializing agency and how far a breeder of non-social interests. Our special concern here is with the role of the schools in building up forces and factors whose natural effect is to undermine the importance and uniqueness of family life. It is obvious to any observer that in every western country the increase of importance of public schools has been at least coincident with a relaxation of older family ties. What is going on in Russia appears to be a planned acceleration of this process. For example, the earliest section of the school system, dealing with children from three to seven, aims, in cities, to keep children under its charge six, eight and ten hours per day, and in ultimate ideal (although far from present fact) this procedure is to be universal and compulsory. When it is carried out, the effect on family life is too evident to need to be dwelt upon—although at present even in Moscow only one-tenth of the children of this age are in such schools. Nor does the invasion of family life stop at this point in dealing with young children. There are in contemplation summer colonies in the country, corresponding to our fresh-air homes for children from slums, in which children from these all-day “kindergarten” schools will spend a large part of the summer months. Some of the summer colonies are already in existence; those visited compare favorably with similar institutions anywhere, with respect to food, hygiene, medical attention and daily nurture. Now, it would be too much to say that these institutions are deliberately planned with sole reference to their disintegrating effect upon family life; as far as conscious intention is concerned there are doubtless other more conspicuous causes. They are part of a whole network of agencies by means of which the Soviet government is showing its special care for the laboring class In order to gain its political support, and to give a working object-lesson in the value of a communistic scheme. One derives from this, as from many other social undertakings, the impression that the Soviet authorities are trying to forestall, in a deliberately planned and wholesale manner, those consequences of industrialization which in other countries have crept upon society piecemeal and unconsciously. For every large Industrial center in any western country shows that in fact the effect of machine industrialization has been to disintegrate the traditional family. From this point of view, the Russian government is doing on a large scale what private philanthropy has done in our cities by means of crèches, etc. But even when these allowances are made, it remains true that we have here a striking exemplification of the conscious and systematic utilization of the school in behalf of a definite social policy. There are many elements of propaganda connected with this policy, and many of them obnoxious to me personally. But the broad effort to employ the education of the young as a means of realizing certain social purposes cannot be dismissed as propaganda without relegating to that category all endeavor at deliberate social control. This article—the fourth in a series about the Russian experiment in education—originally ran in the December 5, 1928 issue of the magazine.